Contra College (March 9-10, 2019) will be an urban weekend focused on teaching Contra dance to new and intermediate dancers, and where experienced dancers can improve their skills, help newer dancers, or practice the other dance role. Here is your weekend opportunity to quickly become more proficient at Contra dance! Build community with a small group of like-minded learners! This is a great opportunity to help a friend or partner become comfortable with Contra dance in a relaxed, low-stress setting. The weekend will be from Saturday 9:00 a.m. to Sunday at 3:30 p.m. and includes the Saturday night (8:00-11:00 p.m.) Palo Alto Contra Dance and Sunday afternoon (4:00-7:00 p.m.) Contra College Graduation Dance (open to the public). In total, there will be eleven hours of Contra College sessions and six hours of regular contra dance time. An integrated curriculum and careful pacing will allow dancers to build skills slowly over the course of the weekend and to internalize what they’ve learned as they go along. There will be plenty of explanations and question-and-answer time. The group’s small size will allow for individualized attention and the dances will be selected to help everyone gain confidence and feel at ease. The carefully-crafted curriculum will emphasize dances that are simple while still being varied and well-choreographed. On Saturday (12:00-1:30 p.m.), there will be a Caller’s Workshop for new and experienced callers that will be led by Jacqui Grennan. The schedule of the college instructional sessions enables regular attendees to also attend the Caller’s Workshop (with separate registration). Attendees will be guest callers at the Sunday afternoon Contra College Graduation Dance (4:00-7:00 p.m.). The cost of the weekend is $120, which includes teaching, music, dancing, meals and snacks, and the Palo Alto Saturday night and Contra College Graduation Sunday afternoon dances. Early registration (postmarked by January 21, 2019) is $100. Some financial assistance is available... so, don't let finances stop you from attending and learning! See details on the registration form. The callers/dance instructors for the weekend are Jacqui Grennan and Alan Winston, and music instruction is offered by Jim Oakden. Jacqui is from the Los Angeles area, and Alan is local to the Bay Area, and all have called dances and been involved in weekends across the country. 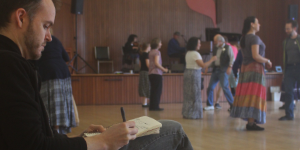 Jim Oakden is from Santa Cruz, and is a musician, teacher, and dancer who brings a huge breadth of knowledge and experience to inspiring people to move on the dance floor. Live music for Saturday will by Jim Oakden and Kevin Carr, and on Sunday by Audrey Knuth and Christopher Jacoby. On Sunday afternoon, Audrey Knuth and Christopher Jacoby will play for the Contra College Graduation Dance with calling by Jacqui Grennan and guest callers from the Callers’ Workshop. For more information on the staff, schedule, program, or registration process, please select the appropriate topic at the top of the page. To read more about the Contra College weekend, please read the article found on page four of the December 2018 issue of the Bay Area Country Dancer. Out-of-town dancers are encouraged to inquire about housing with local dancers. Experienced dancers are encouraged to attend the entire Contra College. There are always things to learn and ways to help others gain experience. Numerous experienced dancers have expressed their interest in supporting the College, but might not be able to attend the entire weekend. These experienced dancers, who might be known by many names including Dance Angels, are welcome to attend to balance the lines and enrich the learning experience. Not everyone is cut out to be a Dance Angel, but if you want to be an angel, please ask yourself if these are the ways you can contribute. Can you dance to the level of the momentary partner (don't try to bring them to your level)? Can you dance the choreography without twirls or flourishes? Part of a Sunday session will touch on this topic, so can you focus on choreography and dance of the moment? Can you let the instructors describe the figures and how to do them? The instructors are well known for their good descriptions, but if you see or hear something that could be clarified, then please ask for the benefit of everyone. Ideally, you can attend the entire college, but if you can not, then can you attend one or more Saturday morning (3 hrs), Saturday afternoon (4.5 hrs), or Sunday afternoon (3 hrs), instructional blocks? Can you help us have angels distributed throughout the weekend? That is, not everyone is at the Sunday afternoon instructional block. Contra College Alumni – How you can support the College? The goal of Contra College is that every person is enabled to participate in this unique learning environment. Here are three ways that you can help. Share your Contra College experience with others, and encourage them to attend. Be a Contra College ambassador. This can be done person-to-person (and the personal sharing is very impressionable), or on social media such as the Contra College Facebook site or other sites that you visit. Re-enroll in Contra College to brush up on your skills, and help in the learning process. Contribute to the Contra College Scholarship Fund (see below). The Contra College Scholarship Fund helps provide the opportunity for someone who (for whatever reason) would otherwise not be able to attend. Donations in any amount are appreciated and can offset registration fees for one or more hopeful participants. Donations for Contra College scholarships and other BACDS projects are tax-deductible. What a gift! For more information or making a donation, please contact David Buesch (Organizer). Contra College 2019 will be held at the Royal Hodge Masonic Center in Menlo Park (651 Roble Avenue, Menlo Park, California 94025). On Saturday (March 9, 2019), the College begins at 9:00 a.m. (sign in at 8:30 a.m.), and on Sunday (March 10, 2019) the College begins at 10:30 a.m. The Royal Hodge Masonic Center is 0.4 miles from the Menlo Park CalTrain station. Unless otherwise noted, layout and content Copyright © 2002-2019, Bay Area Country Dance Society. All rights reserved.